Protein powders are the most popular, versatile nutritional supplements available on the market today—but there’s an unscrupulous practice associated with some of them that could actually be robbing you of your hard-earned money! You may not be getting what you think you are when you buy this product. The supplement world is a shady place. And just like you’re looking to get an edge on your nutrition, some manufacturers are looking for an edge when it comes to the billions of dollars that supplements bring in every year. It’s another dirty little secret being kept by a $7-billion industry. I’ve told you before about filler ingredients and other cost-cutting methods manufacturers might use, and I hope I haven’t robbed you of your faith in supplements—they can be very valuable. As I write this and look in my kitchen cupboard, I see at least six supplement bottles! So I certainly haven’t given up on them. The largest supplement bottle I own by far is my whey protein—but it’s also the most expensive. This is why it pains me to tell you it’s also the most likely to feature filler ingredients. Protein powders are basically dietary supplements that are supposed to contain a high percentage of protein. The powder can act as a healthy meal replacement while serving as a convenient way to add extra protein to your day. Most protein supplements offer 24-30 grams of protein per scoop. In the United States, a five-pound container of whey protein usually costs anywhere between $40 and $60, which will come as a shock to Canadian readers, who usually pay $80-$110 for the same size. Amino spiking is a way that protein manufacturers make it seem like a product has more protein than it actually does. It involves the addition of cheap amino acids like glycine and taurine to boost the protein profile of the product, while making it look like there is more protein than there actually is. An amino-spiked protein powder might claim it has 30 grams per serving, while more specialized tests might reveal that this content is actually far less because it is incomplete. The problem surrounding misleading labels on supplements is so serious that even the U.S. Department of Justice is getting involved! Several federal agencies are set to announce criminal and civil actions associated with dishonest advertising and sale of dietary supplements. Can You Tell if Your Supplement Contains Filler? Now, as a regular consumer, it can be hard to tell whether or not your protein is spiked—there is no difference in taste, appearance, or consistency. But if you look a little closer, there are some important details that can help you determine whether or not you’re actually getting what you pay for. Personally, I never trust a protein powder label that claims it has more than 26 grams of protein per scoop. So instantly anything higher is off my list. But under that mantra, I would have purchased Lean Shake 25, so there needs to be more. Some protein manufacturers list the product’s amino acid profile on the label, which is a good indication it’s a trustworthy source. You might see some ingredients like glycine and tyrosine, but in this case it’s safe to assume they are naturally occurring, not filler. Because the supplement industry is unregulated by the FDA, buying products that are third party-tested for purity is also a way to limit your chances of being ripped off. Some of the labels you can look for are the “Informed Choice,” “GMP” or “NSF” labels to indicate quality. These labels are important to recognize because some manufacturers create their own labels—like GNC—to emphasize purity. If it doesn’t have at least one of the above approvals, then don’t buy it. Protein supplements are for convenience purposes and are definitely not the only, or even necessarily best, source of protein. Great nutritional sources include chicken breast, turkey breast, eggs, egg whites, tuna, tilapia, salmon, and steak. But supplements do make it easy to get some protein on the go, while satisfying cravings you might have. For example, I have a bit of a sweet tooth, and typically make a protein powder pudding at least once per day! 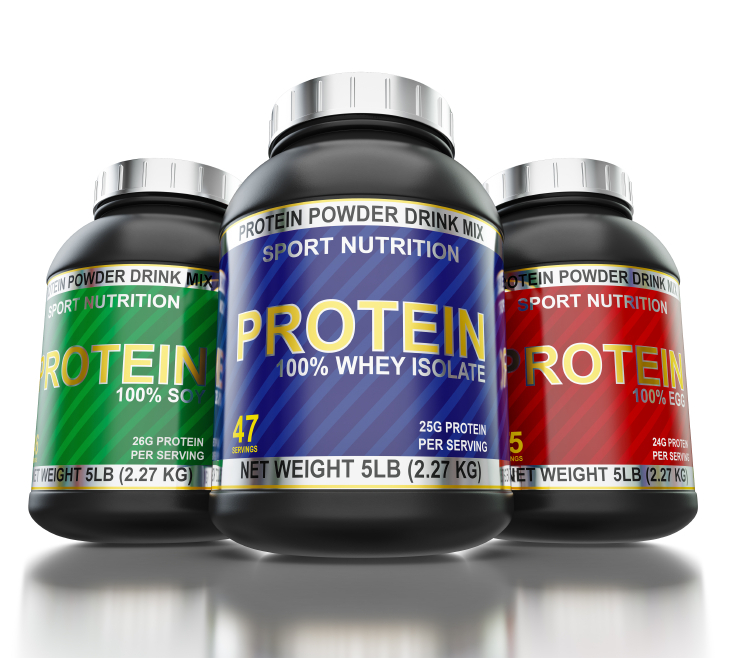 Greene-Griffith, M., “Marketplace: Some Protein Powders Fail Fitness Test,” November 13, 2015; http://www.cbc.ca/news/health/marketplace-protein-powders-1.3313084. Morrell, A., “Lawsuits say Protein Powders Lack Protein, Ripping of Athletes,” Forbes web site, March 12, 2015; http://www.forbes.com/sites/alexmorrell/2015/03/12/lawsuits-say-protein-powders-lack-protein-ripping-off-athletes/. “U.S. to announce actions against dietary supplement makers,” Reuters web site, November 17, 2015; http://www.reuters.com/article/2015/11/17/us-doj-investigation-dietarysupplements-idUSKCN0T628320151117#POjICJwLdHpQtHEY.97.